IBEW leads the way; will merit shops do their share? With a looming manpower shortage the likes of which the construction industry has never faced, it is imperative that all sectors of the construction industry, union and non-union, do all they can to recruit and train new journeymen. The IBEW would like to take this opportunity to recognize our signatory contractors and give special recognition to he NECA San Diego members (in bold), our partners in moving the elctrical industry forward. The National Electrical Contractor Association (NECA San Diego) is proud to recognize long-standing member Power Communication Systems Inc. for receiving national acclaim from Siemens (NYSE: SI) as the winner of the "Star Performance Award" for best overall performance in the Western Regional United States. Dan Sullivan graduated from the IBEW-NECA apprenticeship program in 2002. Two years later he started his own business, Sullivan Solar Power. In 2008, Sullivan's business continues to grow and thrive. IBEW Local 569 president and west Chula Vista resident, Nicholas Segura Jr. is a well-rounded union and community leader. He served for four years in the U.S. Navy as an electrician mate. After he completed his service, he decided to purse a civilian career in the electrical industry. Segura was working as a non-union electrician when a friend and IBEW 569 member told him about the many benefits and opportunities of becoming a union electrician. On Sunday night, Oct. 21, 2007 at about 7 p.m., Tom Hedges could see the glow of the wildfires coming over the mountains toward his home in Ramona, a rural, inland community of about 40,000 in northeast San Diego County. Hedges and his wife started gathering important papers, their eight cats and some valued possessions from a safe when the power went out. They grabbed flashlights, found six of the cats and headed toward Ramona. Then, Hedges realized he had left his wallet and cash on the kitchen counter. There is no doubt that communities across California are suffering. Tight budgets, high gas prices, the collapse of major financing companies, and the widespread impact of manipulative home mortgage schemes are hitting working families and their communities hard. In what is arguably the broadest, most detailed study ever conducted on the merits of project labor agreements (PLAs), three economic researchers have concluded that PLAs do not reduce the number of bidders or change the costs of construction projects, as frequently claimed by contractor lobby groups such as the Associated Builders & Contractors. We all know that Chula Vista, like many small cities across the country, is facing a serious financial crisis. City government, community groups and local businesses are all looking for the best way to pull Chula Vista out of the red, knowing that how we choose to invest now will have a direct impact on our city, our economy and our future. The California Legislature mandated that as of Jan. 1, 2006, all electricians working for an electrical contractor with a Class C-10 license must be certified by the state. The mission of the San Diego Apollo Alliance, a joint venture between organized labor, community, environmental groups and environmentally minded individuals, is to promote the manufacturing of and implementation of renewable and green technologies in the San Diego region. Investing in this new green economy will improve quality of life, create good quality jobs and training, promote sustainable communities, preserve natural resources and reduce our region's dependence on fossil fuels. President George W. Bush was the keynote speaker at the recent Washington International Renewable Energy Conference. The president and a host of cabinet-level speakers, including current State Department of Energy Secretary Samuel Bodman, addressed delegates from more than 150 countries on new polices and mandates that will target solar, wind and bio-energy technologies. Dianna Rubalcava was just 7 when her parents divorced and her mom needed to find a way to support Dianna and her five siblings. 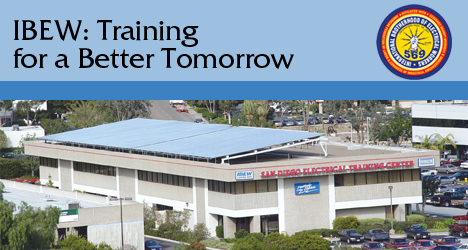 IBEW 569 is leading the way in spurring the creation of green-collar jobs in San Diego and Imperial Counties. We are often asked, "What is a green-collar job?" Can we make the claim that it pays to be union? Well according to the U.S. Department of Labor's Bureau of Labor Statistics, in 2007 the number of workers belonging to a union rose by 311,000 to 15.7 million union jobs -- and average earnings were indeed higher than non-union members.